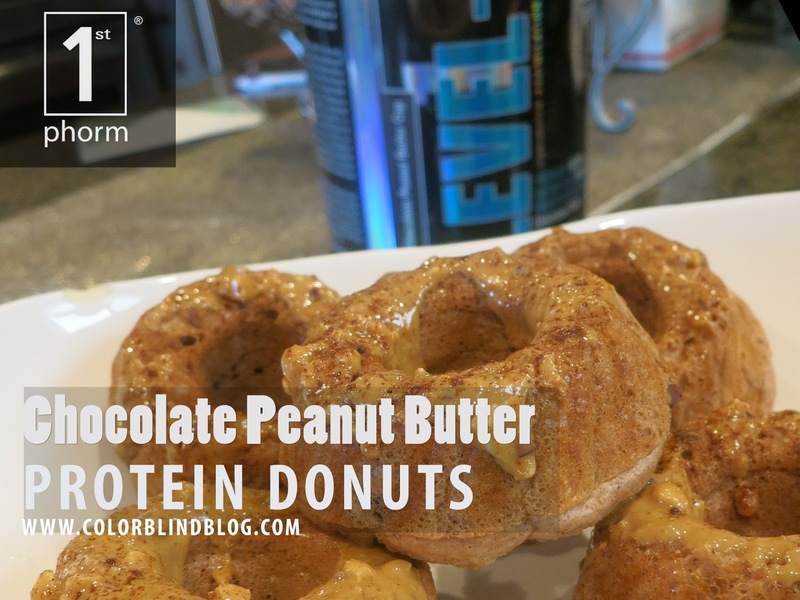 EAT like a Bikini Competitor: My 1stPhorm Peanut Butter Cup Donuts! but first...Pre-Heat your oven to 350 Degrees! Sprinkle Cinnamon in the batter and on top as desired! 1 tbsp baking powder I played around with the serving it really created a fluffy texture so good! 5 drops of the Stevia, or to your desired sweetness...there are so many flavors I just happened to have the English Toffee and it was delicious! HERE are a few other flavors. 1/3 Cup Oats Now you guys know I love Coach's Oats, but when making these I find the rolled oats work best. NOW, Most oats are Gluten free as a note, but you can also get GLUTEN FREE at your local grocery store! The Ninja...my favorite Appliance in my kitchen as of now thank you Costco..you can also find it HERE on amazon! Throw in all of the ingredients in to the cup and blend away! I found that if I let the mixture sit in the Ninja cup closed for a minute it starts to rise....then be careful when you open it, it will go every where! Grab some Cocunut Oil Spray and spray down your pan. You can use a muffin pan, a mini bundt cake pan...I got mine from savers for $2!!! I liked the size of this! There it is. That mixture made 6 I didn't fill them up completely as they will grow! You are going to bake these for 8 minutes... I found that was perfect timing! Remove them from the pan on to a rack immediately to dry out a little. I would say a minute or two. The Protein has actual pieces of chocolate so it really makes for a great flavor and adding the nibs made it even better!!!! I melted the peanut butter just a litte...the whips wouldn't need melting at all... and glazed them lightly..I ended up only using the 1 tbsp which was perfect for my macros for my meal! The Chinky peanut butter was great since I loved the crunch from the peanuts. The hubby wasn't thrilled with the peanut butter so we used the Walden Farms Maple Syrup for his! Make yourself a cup of coffee...my favorite right now is the Cinnamon Dolce!!! ENJOY!!! Please Share your variations with me on Instagram! You can fine me @shanaemily_ Make sure to TAG me so I can see! I am sure I will have some tweaks to this and a video will be coming soon but I just couldn't wait! and I mean..it is #NationalDonuDay after all!!! HUBBY Approved! Stay tuned for his thoughts! You can find more of my Recipes and #MEALPREPSUNDAY on my Youtube Channel!!! I need to find the donut/bundt pan!